Beijing said Tuesday it is "firmly opposed" to foreign involvement in the regional disputes. 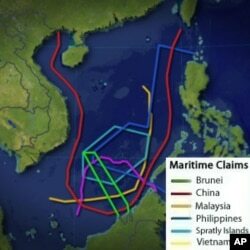 it also warned other Asian nations to refrain from "irresponsible" comments on their competing maritime claims. The comments appeared in the Liberation Army Daily, the newspaper of the Chinese military. They followed the introduction of a congressional resolution by two U.S. senators that accuses Beijing of using force in the disputes and calls for the U.S. military to "assert and defend freedom of navigation rights" in the South China Sea. China responded furiously last year after the United States joined several countries at a regional security summit in calling for a multilateral approach to resolving South China Sea disputes. Secretary of State Hillary Clinton also declared a U.S. national interest in maintaining free navigation through the waterway. China, Vietnam, the Philippines, Taiwan, Brunei and Malaysia claim all or part of the Spratly Islands. China, Vietnam and Taiwan also claim the Paracels. China says its claims date back for centuries. China is also criticizing a U.S. senator’s call for multilateral negotiations to resolve territorial disputes in the South China Sea, and says it would rather pursue one-on-one dialogue with rival claimants. Foreign Ministry spokesman Hong Lei Tuesday was asked for a reaction to legislation introduced in the U.S. Senate that condemns China’s actions in the South China Sea and calls for a multilateral solution to the territorial dispute. Hong accused what he referred to as “some countries” of hurting China’s sovereignty and maritime rights and interests. Hong accused critics, including some in the United States, of trying to expand and complicate the territorial dispute. The Spratlys are the main disputed island group in the South China Sea. They are near key shipping lanes and are believed to sit on top of large oil deposits. China’s claims over islands in the South China Sea overlap with those of Brunei, Malaysia, the Philippines, Taiwan and Vietnam. The spokesman said China is trying to safeguard its own rights and interests. He added that China will not resort to threats or the use of force. Hong says China hopes countries not related to the issue will respect the efforts of countries directly related to the issue to resolve the disputes through direct negotiations. Although he did not mention the United States by name, he was responding to a question about the legislation that calls for the U.S. military to defend freedom of navigation in the South China Sea. The Chinese comments come amid increasingly heated exchanges between China and rival claimants the Philippines and Vietnam, which held a live-fire naval exercise on Monday. The Chinese spokesman had a relatively mild response to the Vietnamese naval exercises. He said only that Beijing hopes relevant parties will do more to contribute to peace and stability in the region. The United States is not directly involved in the territorial dispute in the South China Sea, but American officials say Washington has an interest in protecting freedom of navigation rights in the region. In Washington, the bipartisan U.S. Senate bill urges a peaceful and multilateral resolution to the South China Sea issue. China has instead maintained that it would like to resolve the territorial dispute with each claimant, separately.